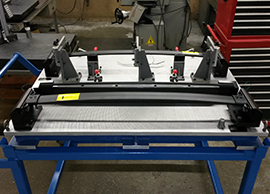 This machine de-gates (cuts) the plastic gate off of a roof rack for a sport utility vehicle. 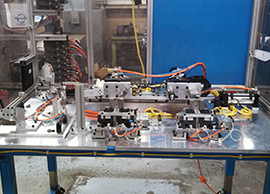 The team at LTC rebuilt this machine from an existing machine for the new product. LTC also upgraded the PLC (programmable logic controller). 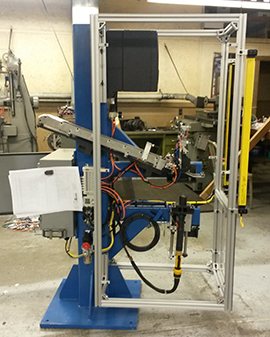 An example of an attribute gage built by LTC for an automotive supplier. This style of gage is used to check basic dimensions of a stamped sheet metal part. Attribute gages are utilized in all manufacturing industries. 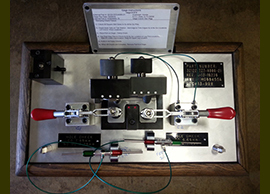 This is a dual purpose gage built by LTC for an automotive supplier. It is an attribute gage as well as a function checking gage. The attribute side of it checks basic dimensions. The function checking side verifies that the part will work as intended on the end product. This is an automotive example of a cross bar gage for a sport utility vehicle. Electrial Controls Panel for the torque fixture machine described above. 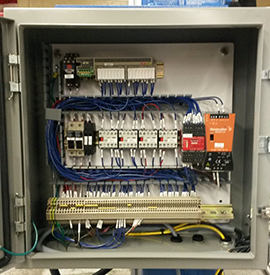 This control panel was designed and built at LTC along with the torque fixture machine. This is an example of a test fixture from LTC. The fixture tests the integrity of a door handle and is in a piece of equipment that places a force on the part and confirms that it is to spec. 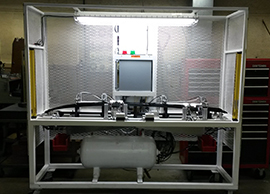 This fixture or machine, assembles an emissions line for an automobile and test the assembly for leaks. 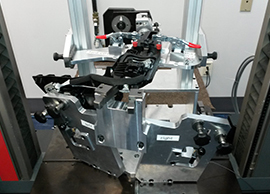 This was a retool at LTC, meaning this machine assembled another part before it came in, and was retooled at LTC to build a new part. This is one of a group of assembly tables. 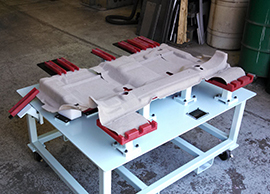 These tables were used to attach Velcro and HVN pads to the bottom side of automotive carpet. This would not be considered a machine. The operator used a pneumatic staple gun to attach pads and Velcro that holds the carpet in place once assembled in a vehicle.